Looking for the perfect gift to give that special someone? Slip a gift certificate for Vermont’s romantic Inn Victoria into his or her stocking! Check out our Special-Moment Romance Package and then give us a call—we’ll help you put together the ideal gift featuring just what the two of you like to do. Or how about cozying up under a blanket for a sleigh ride through the countryside? Taylor Farm has sleighs pulled by Belgian horses for its 45-mintue ride, complete with a fireside stop in the woods. Your special package to Inn Victoria will include a luxurious guest room or suite that has a private bath with plush Turkish towels and robes, claw-foot tub for two, shower for two, an outdoor hot tub, and a delicious gourmet breakfast served in elegant surroundings. This year give a gift that will have lasting memories—a stay Inn Victoria, one of the most romantic inns in all of New England! 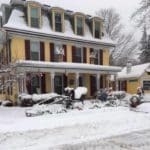 This entry was posted in Chester, Christmas, Gifts, Romantic Getaway, Romantic Vermont B&B, skiing, sleigh ride, Winter and tagged Cross country ski vermont, holidays, Inn Victoria, Romantic Bed and Breakfast, Romantic Vermont B&B by Penny & Dan. Bookmark the permalink.